Just regular folks. 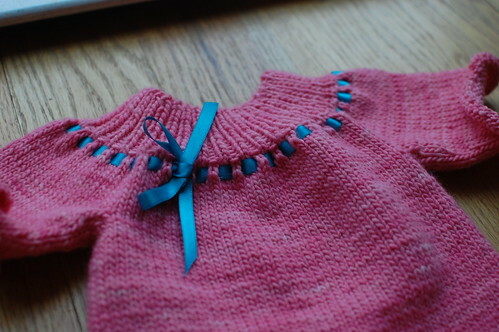 : Lessons learned from knitting. I'm back on the knitting bandwagon. I've finished 3 projects since the beginning of February and in order to fit this habit into my day, I've dropped my other habit of reading books for pleasure. I'm trying to combine the two by checking out these weird recorded books from the library called Playaways and listening to them while I knit. They have a preloaded book on them and so you just provide your own earphones and hit PLAY! Since I don't use an iPod, I thought this would be a good way to read and knit at the same time. Unfortunately, I think that hearing is my least sensitive way of gathering information. I am very good at not listening to anything. Just ask Jeremy. This afternoon, I fell asleep "listening" to Prep, the person who was reading is sooo soothing. I don't know if this knit/reading thing is going to work out too well. I've also come to the conclusion that with knitting, the more money I spend on the yarn, the better the final project turns out to be. 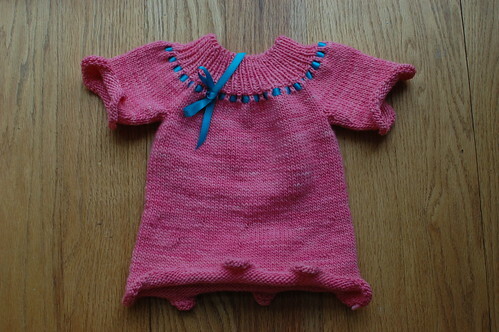 It's crazy, if you want to buy beautiful yarn to knit an adult sized sweater, you could easily spend $200 or more. So now, I'm going to buy nice yarn and keep the projects small so I don't need to use too much of it. For example, this is sized for a one-year old. Now I just have to find a one-year old who wants to wear it. This yarn was given to me by a mom of one of Vince's pals, she runs Three Irish Girls! Cute. I love the blue ribbon detail.